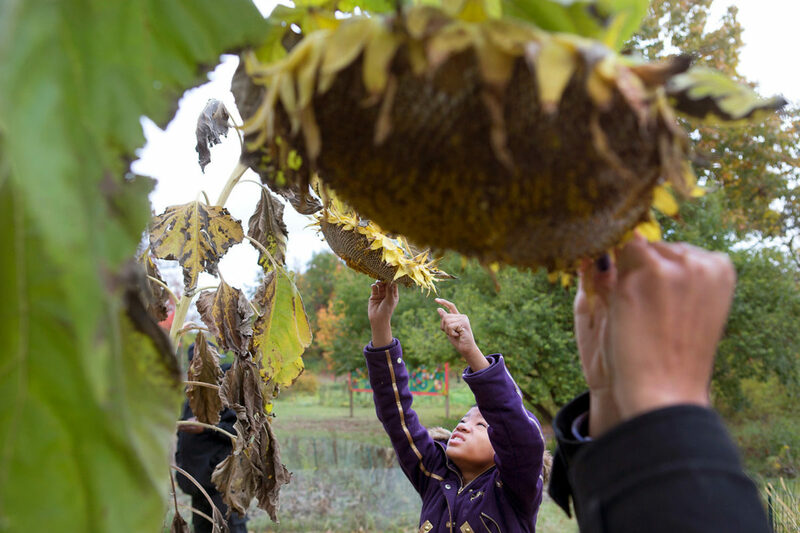 Destiny Marshall picks sunflower seeds at D-Town Farm during a tour of the seven acre locale in Detroit, Mich. D-Town Farm is part of the Detroit Black Community Food Security Network and began in 2006 on the west side of Detroit. Volunteers can come to help work on the farm, where a majority of the produce is then sold back into the community at farmer's markets. 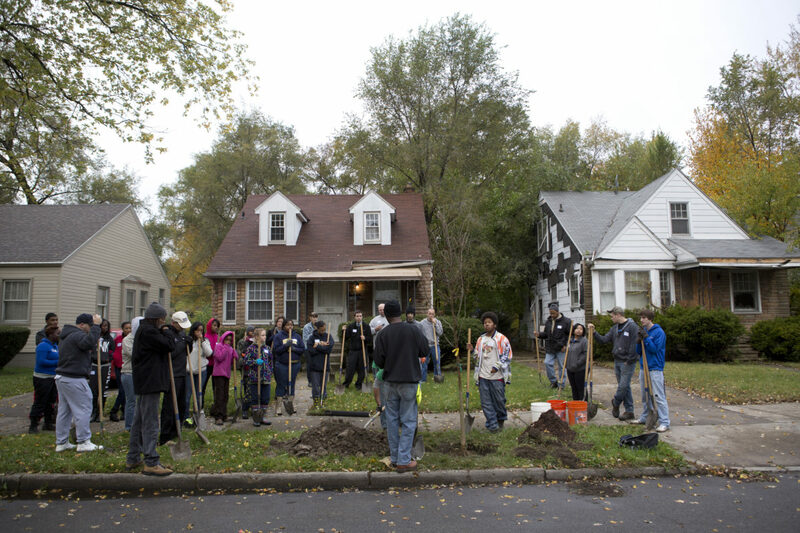 Diontae Matthews, a Citizen Forester apprentice (fifth right), listens to Chris Hardy (center), a Citizen Forester with the Greening of Detroit, along with several other volunteers, on how to properly plant a tree in the Cody Rouge South neighborhood of Detroit during a tree planting event. The volunteers planted mostly Maple and Oak trees, which will grown to be large shade trees. The non-profit was aiming to plant 1,100 trees by Thanksgiving. 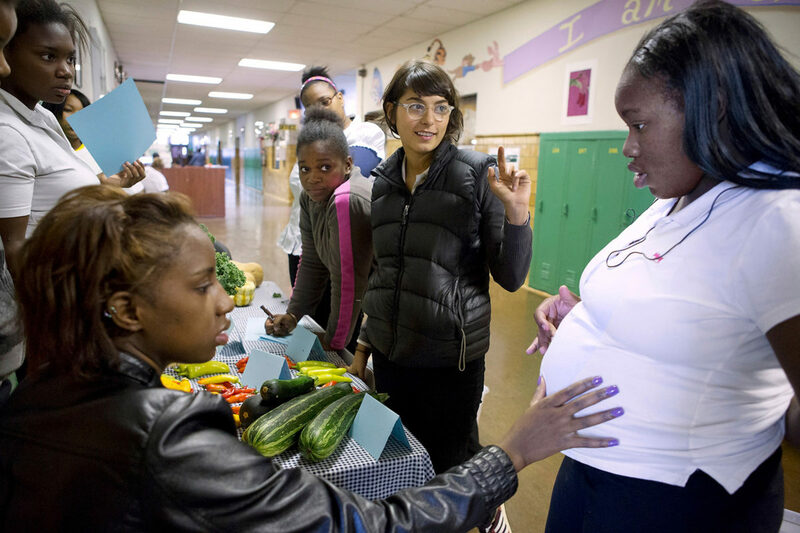 Dana Applebaum, center, farm educator at Catherine Ferguson Academy, pauses as Kanisha Miller touches Shantanique Dixson's pregnant belly during a farmers market at the school. CFA opened in 1986 and was designed for young mothers and expecting mothers trying to finish high school in Detroit. The school has since closed. 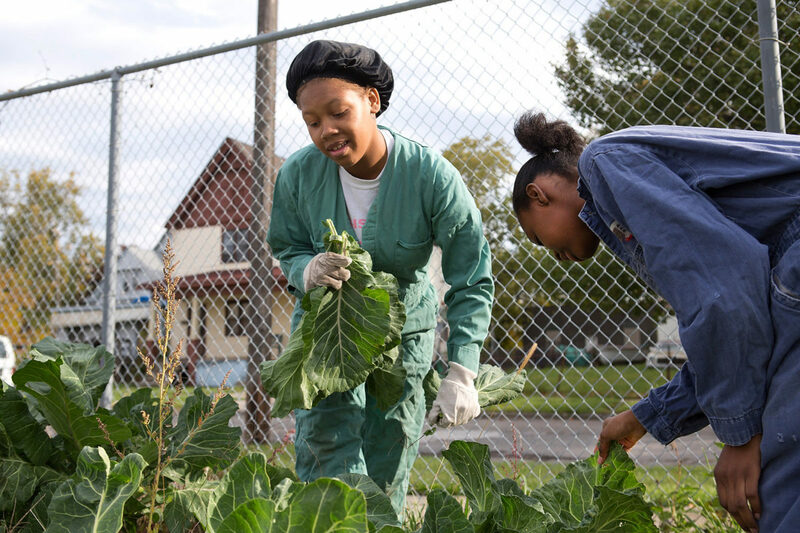 Students in the Farming Mothers Club pick the last of the harvest in the two-and-a-half acre lot behind Catherine Ferguson Academy, which houses a working farm, complete with goats, chickens, sometimes ducks, rabbits and a horse. The agriculture curriculum began from an idea by former teacher and urban farmer Paul Weertz, who taught at the school for more than twenty years. The school has since closed. Ajhane Thomas, 18, a student at Catherine Ferguson Academy, walks back to the school barn as Jon Miller of Detroit carefully leads his draft horses, Tess and Tara, around the urban farm for the first time at the school. Miller and his horses plowed through garlic plots on harvest day at the school. Miller had hopes that the horses could stable closer to the city to do farm chores and provide educational outings in the city on a regular basis. Catherine Ferguson Academy was a school devoted for young mothers and mothers-to-be in Detroit. Farming Mothers was a club that was established to expose students to agricultural business. There were 200 students enrolled in the school at the time. CFA eventually closed. 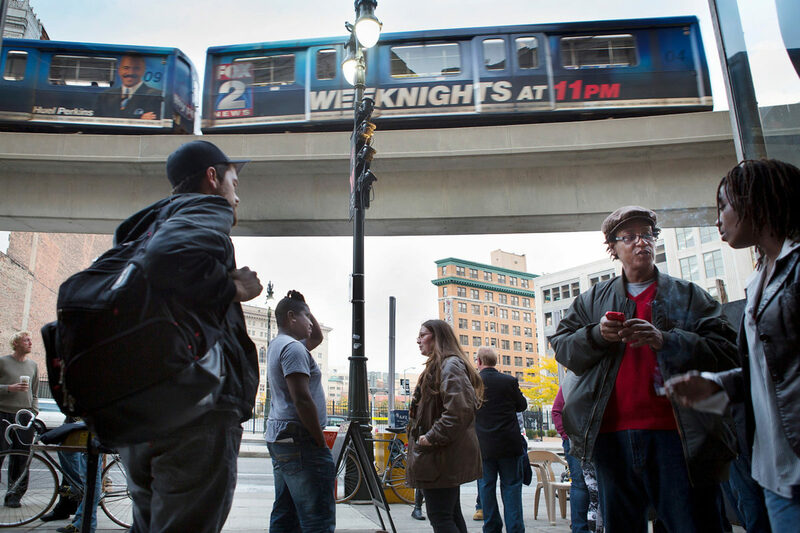 Occupy Detroit activists stand outside of 1515 Broadway Cafe on the one-year anniversary of the movement as a People Mover passes through its route. "I feel like something needs to change in this country and there's a lot of people getting together talking about how we can affect that change and I think it's really important," participant Marsha Spencer of Wixom, Mich. said. About 200 people attended the event at Grand Circus Park, according to Erik Shelly, a member of the Occupy Detroit Media Team. 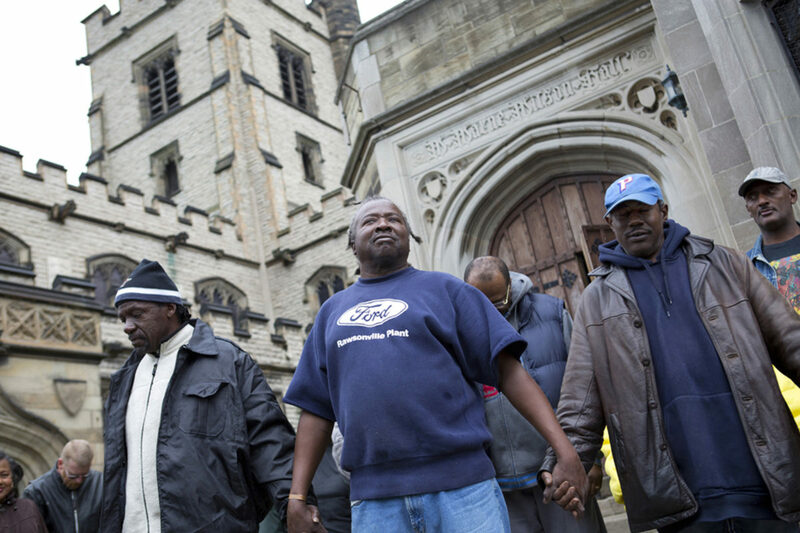 Members of the community, including the homeless and the church janitor (center), gather in front of Spirit of Hope church on a Saturday afternoon during the soup kitchen time, where free handouts of socks and Bibles were distributed. 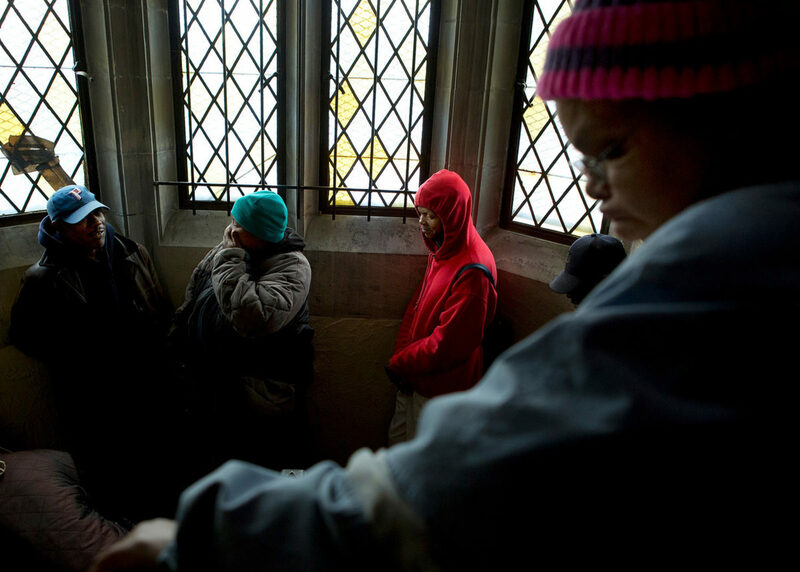 Homeless men and women form a line to wait for the soup kitchen at Spirit of Hope church in North Corktown to open on a Saturday afternoon. 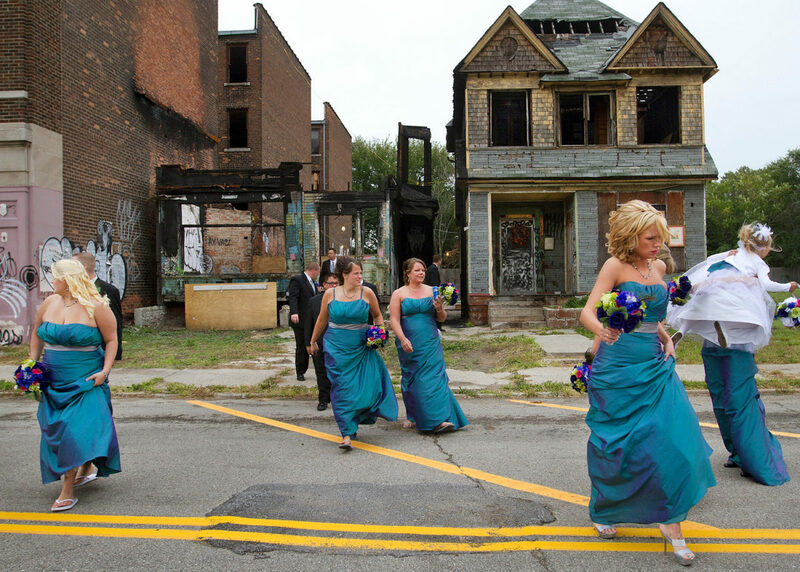 North Corktown is the oldest neighborhood in Detroit, once settled by Irish immigrants. The church was known as a place of refuge for many seeking spiritual sustenance, and continues to fulfill that role today. 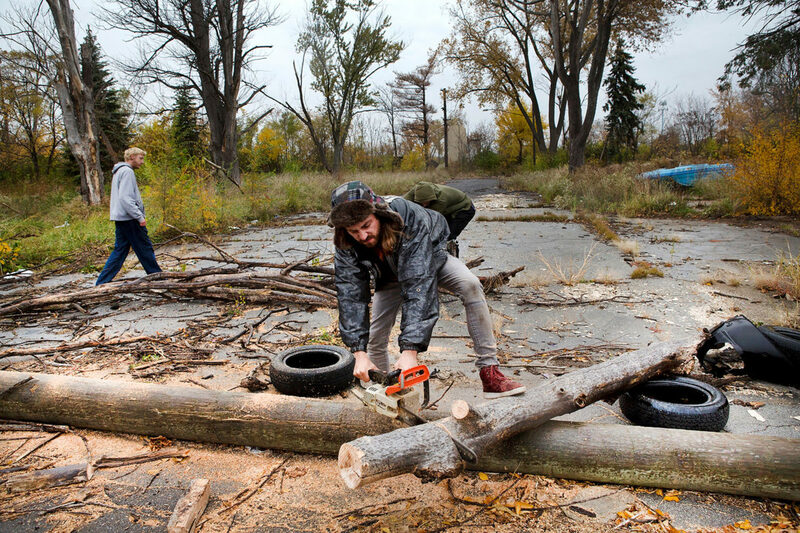 Susan Sunshine, left, an Occupy Detroit activist also known as The Earth Poet, talks to local resident Jerry Peterson while he picks tomatoes out of an urban garden at Spirit of Hope in North Corktown. Other community members forage in the background during a work day open to the community at the farm. The farm has been open since 2007 and was started by Kate Devlin. "If I can make it better in some way then that's what I feel drawn to do," she said about her role in the community. Mars Psymons, center, cuts and collects wood found on a dead-end street with fellow Golden Gate residents so they can use it for fire. 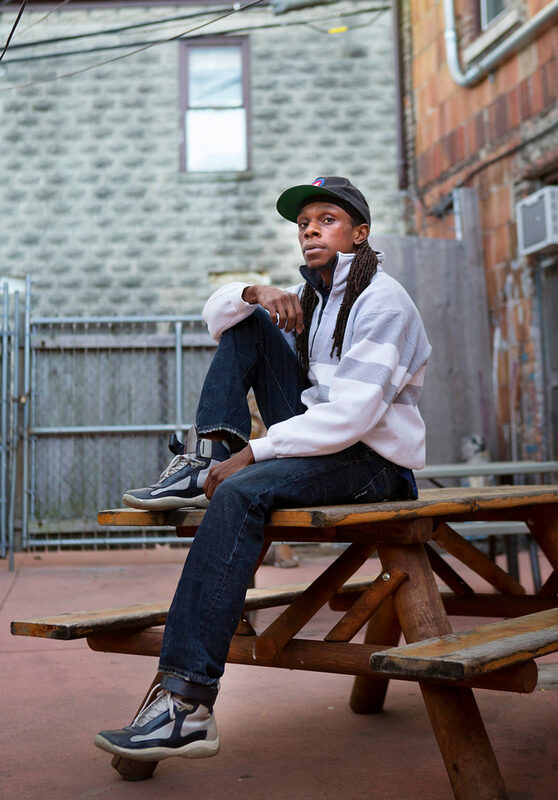 Psymons was a founding member of the Golden Gate community, an eleven house community that functioned as a cohesive group, promoting self-sustainability, urban agriculture and an alternative way of life. All of the residents were essentially squatting in unoccupied homes but indicated interest in eventually purchasing the property. Psymons along with Tyler Brazley, Shane Clark and Marshall Stephens drove around their neighborhood to scour any dead tree limbs that they could cut with a chainsaw for firewood. Some were found near a dead end street, others found on overgrown lots in front of abandoned homes. By the time they returned, the bed of the pick-up truck was brimming with freshly cut logs. Marshall Stephens, 27, shares a meal with a neighbor in the Golden Gate Community collective of Detroit. Stephens was one of 22 people in the collective, which began in November 2011. He lived without electricity or running water. "It's really elemental. There's a challenge to living here," he says. "But you're in touch with the neighbors." 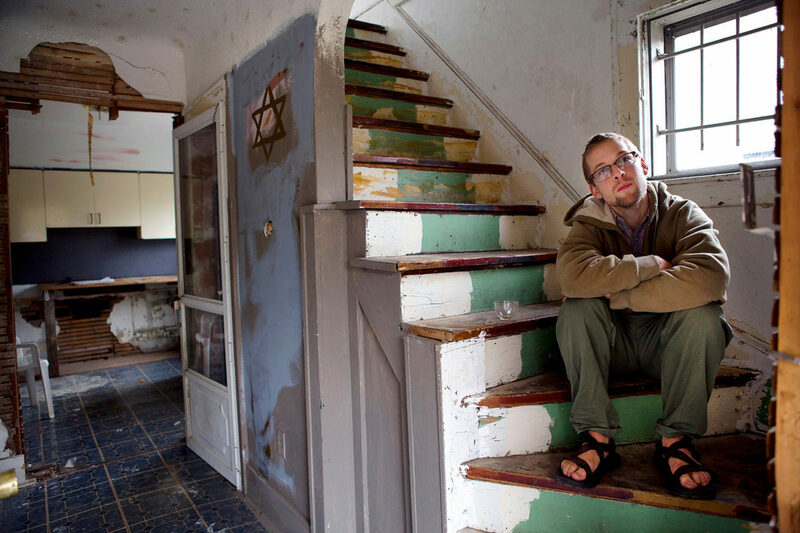 Marshall Stephens, 27, sits in the stairwell inside of a house on West Golden Gate Street where he lived for six months in 2012. He had recently returned from the Peace Corps in Thailand. Stephens was one of 22 people who belong to this 11-house community called Golden Gate. 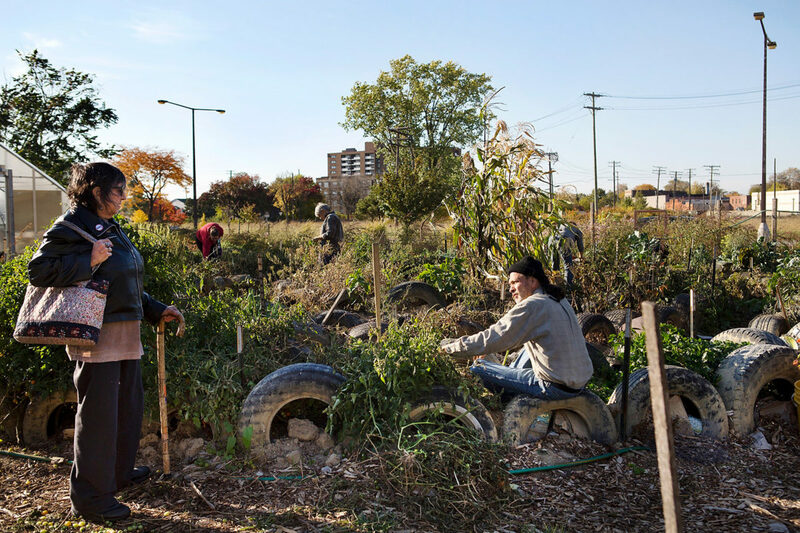 The neighborhood functioned as a cohesive group, promoting self-sustainability, urban agriculture and an alternative way of life. All of the residents were essentially squatting in unoccupied homes. Stephens lived without electricity for six months. "My family...they're like, why are you living here and squatting in a house? And my answer is pretty much because it just feels right living here. It just feels good. I can sit down and like, have a thought. That's it. There's a point where you have to put the stop button on logic and reason and just kind of go with like the feel of stuff and it's been an adventure...Every day is like an adventure here," he said. 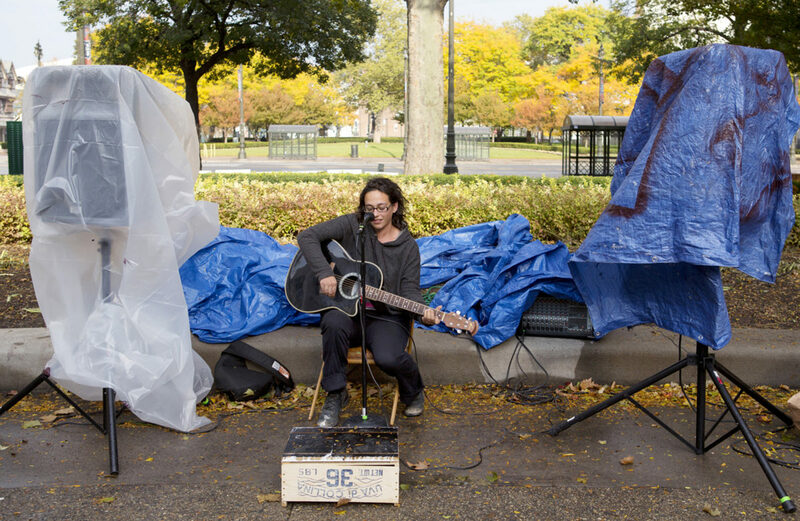 A woman continues to sing at Grand Circus Park long after the crowds have gone home during Occupy Detroit. Kadiri Sennefer, born and raised in Detroit, was a farm manager at D-Town Farm. Sennefer was with the farm since it relocated to West Outer Drive in Detroit in 2008. Sennefer was part of the youth movement within Detroit. He taught children who visited the farm and created music about food justice and urban agriculture. "It's given my life purpose. Like, I didn't feel like my life had purpose prior to. It's a wonderful cause to work for. I could see the benefits within my personal life, having access to healthier foods…I try to share that with my friends and family. People respect what I'm doing. What we're doing. It's dynamic," he said. 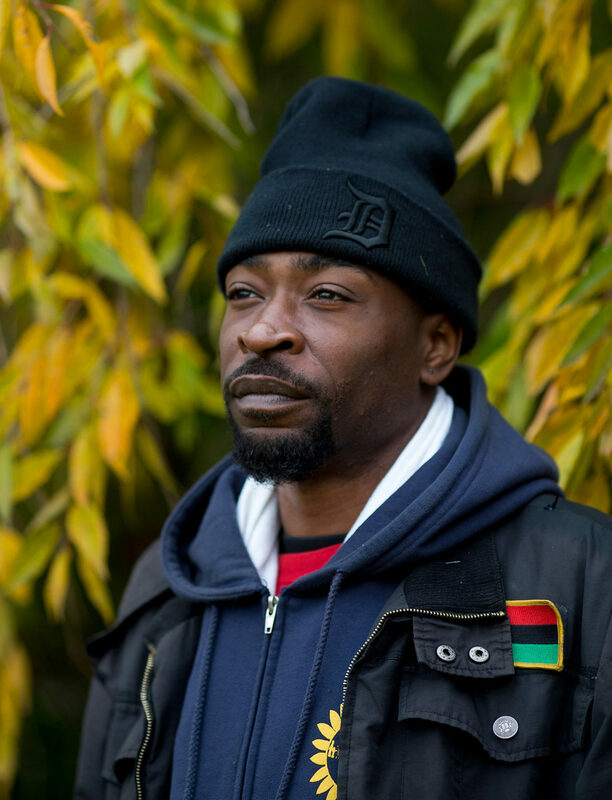 Sennefer is grateful for Malik Yakini, the founder and executive director of the Detroit Black Community Food Security Network, crediting him for providing opportunities and being an example of self-determination in the city. Sennefer passed away November 2, 2018 from a battle with lung cancer at 40 years of age. 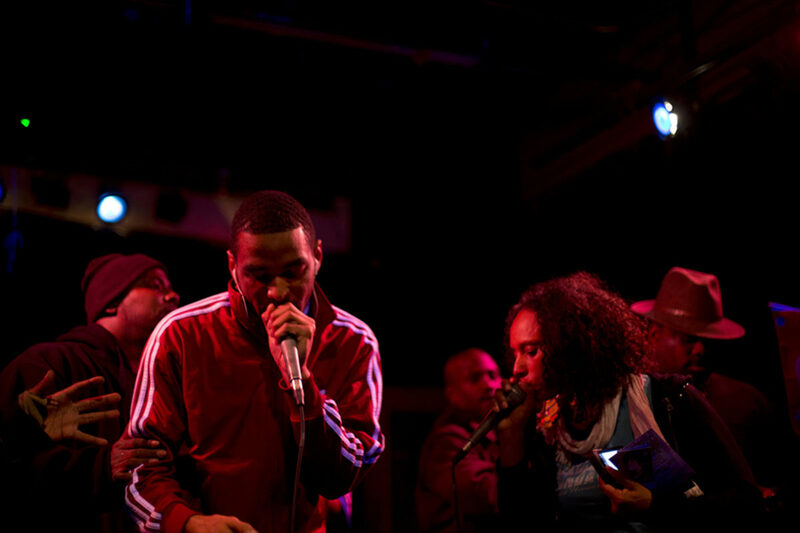 Kadiri Sennefer, also known as S.I.R.I.U.S., and Bryce Anderson-Small, also known as BRYCE, rap together on stage at the Contemporary Art Institute of Detroit during a celebration of urban gardening and farming through art and performance. Sennefer worked on an urban farm in Detroit, D-Town Farm, and Anderson-Small helps mentor youth through media literacy. "The D, Detroit, I think is synonymous with determination because the people here are determined. We don't have it easy. Yet we continue to push forward…in the midst of what everything that they're saying about Detroit, there's prosperity and abundance and a great deal of it flowing through Detroit. You can see it in the art, you can see it in the agriculture, you can see it in the people thriving. It's a dynamic and wonderful time in Detroit at this moment. At the same time there are people hurting. But I think that these conditions are what makes it so outstanding," Sennefer said. Bryce Anderson-Small, a former record executive, now devotes his time to youth media literacy with his company, Detroit Recordings. 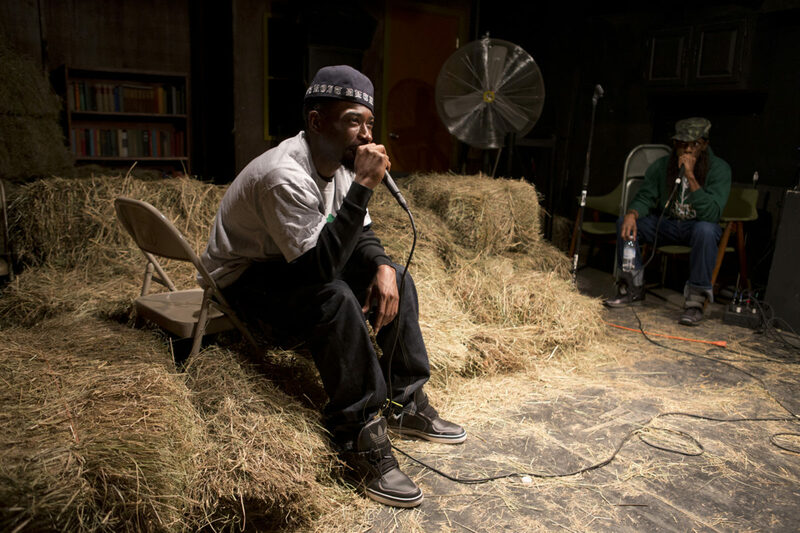 He also rapped with Kadiri Sennefer, a farm manager at D-Town Farm. Here, Anderson-Small sits outside the Artist's Village, a space for performers to rehearse and convene. 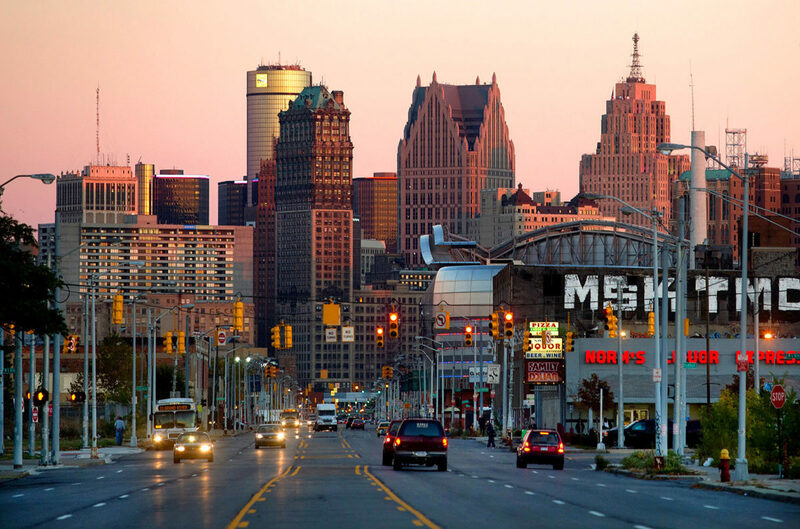 The sun sets over the city of Detroit on Martin Luther King Jr. Boulevard. A celebration of women in hip-hop at The Old Miami in Detroit. 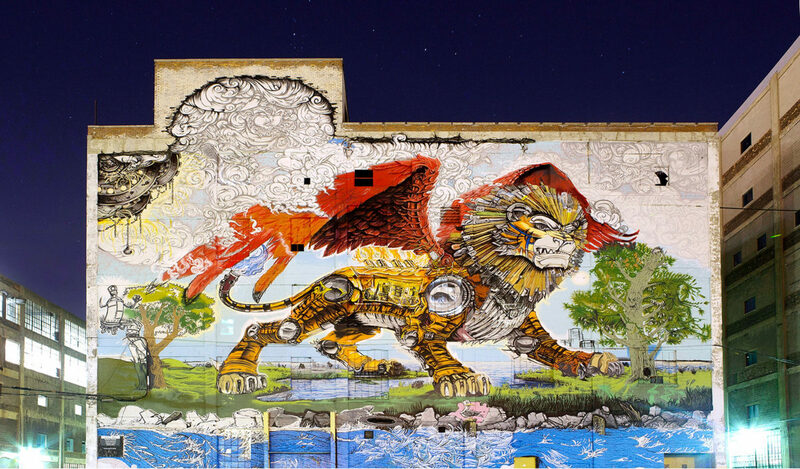 The Chimera by Detroit graffiti artist Kobie Solomon is an 8,750 square foot spray-painted mural on the westward wall of Building #2 at the Russell Industrial Complex. The mural can be seen by motorists going in both directions on Interstate 75. It is the largest spray-can art mural in the state of Michigan. Begun in 2009, Solomon said in 2012 it was yet to be finished due to funding. This mural was shot with a long exposure at night. These buildings are now a reminder of where the city has been and it is impossible to forget. Detroiters can never forget the rise and fall of the automobile industry, the riots that swelled from a early morning booze raid in 1967 that quickly escalated to center around race and the eventual white flight. Burned and empty houses are a reminder of this past. Once with a population of 1.85 million in 1950, it is now home to less than 700,000 people, according to the U.S. Census Bureau. It is within this population of those that have stayed that are rebuilding the city day-by-day and are changing the definition of the American Dream.